Had to make a good breakfast for my first relaxing Saturday at our new apartment! We don’t have nearly all the stuff we need in our apartment, but we’ve managed to make do with meals since moving in. Anyways, no syrup yet, but I had stale bread from the bakery that Leo’s dad bought last week when they were in town. 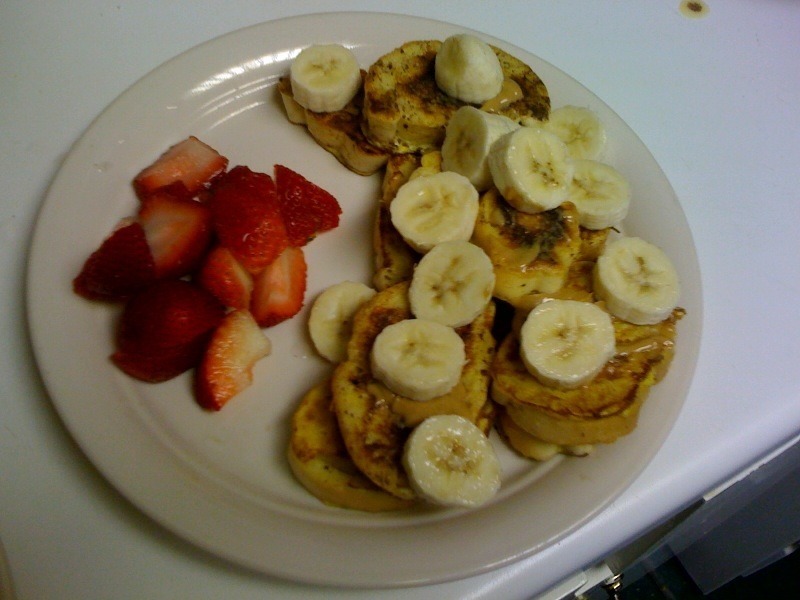 Stale bread = perfect reason to eat french toast. But without syrup? Peanut butter and fresh bananas did the trick! After a whirlwind week of moving, hosting Leo’s family for a day and vacationing in Las Vegas, I am so happy sitting on the couch! I love living with Leo, so fun! My favorite part of cohabiting so far? All the stuff you learn about someone when you live with them. We’ve been together for three years, I had no idea I was going to learn even more about him after moving in! Off to experience summer in the city, not sure if I’ll end up at Ribfest or Bluesfest, but its sure to be a good day!